The cultural material and artifacts located in Scarborough Harbor potentially comprise one of the world’s most important sources of material concerning 17th century seafaring, ships and maritime culture. As such, a concerted effort was initiated in 2007 by Dr. Kroum Batchvarov, (Assistant Professor of Maritime Archaeology, University of Connecticut) to obtain permission from the Tobago House of Assembly (THA) to conduct proper scientific excavations and conservation of these endangered material remains. In April 2012, after 5 years of lobbying, the THA issued Batchvarov and his project team a permit to conduct an archaeological investigation of the shipwrecks located in Rockley Bay, Scarborough Harbor. In 1677 a French squadron assisted by a large detachment of troops attempted to wrest control of Tobago from the powerful Dutch West Indies Company. 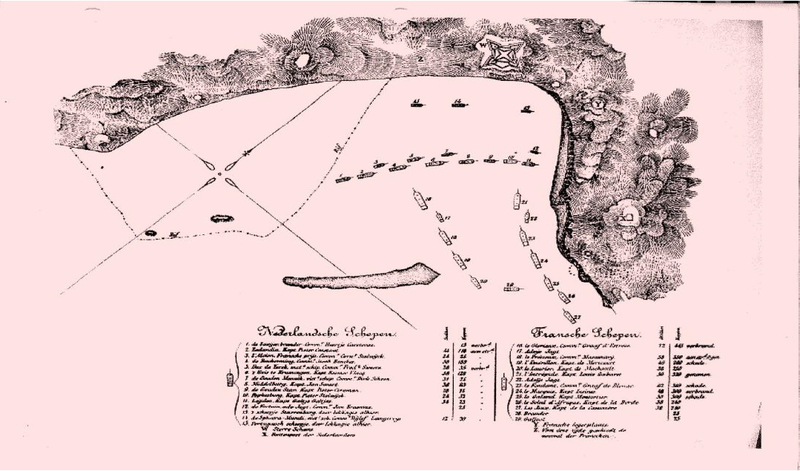 The two sides engaged in battle at what is today called Scarborough Harbour (Tobago). At the end of the engagement, the Dutch had lost more vessels, but they succeeded in repelling the French landing party, destroying the four largest French vessels (including the flagship) and retaining possession of the island. In the 1990s Mr. Wes Hall located some of the vessels that were sunk during that battle in Scarborough Harbour. After Mr. Hall graciously contacted the Institute of Nautical Archaeology at Texas A & M University, a team of researchers from the Institute applied for and recently received a permit from the government of Tobago to conduct a multi-phased archaeological investigation of the sunken vessels. In 1990, the Tobago House of Assembly (THA) commissioned the construction of a new marine terminal in Scarborough Harbour, Tobago. This project included the dredging of the harbor to facilitate larger draft vessels. During construction, ballast rock, cannon, ship timbers, associated artifacts and human bones were encountered. Based on the material discovered by the construction crews including an 18 pound bronze cannon dated “1663” and bearing the crest of Louis XIV, it is possible that remains from the previously lost “Battle of Scarborough Harbour” had been uncovered. As a result of these finds, the THA commissioned Wes Hall, an experienced marine archaeologist and member of Clive Cussler’s team which found the C.S.S. Hunley submarine, to conduct an underwater archaeological survey of the inner harbor. During the first survey, Hall identified two sites containing wreck material. Hall designated these sites “A” and “B” (Hall, Phase 1: A Marine Magnetometer Survey and Submerged Cultural Resource Reconnaissance of Rockly bay and Scarborough Harbour, Tobago, 1999, p. 10) . In 1992, the THA commissioned Hall to conduct a second survey in order to identify the location and extent of Target “A” to ensure that a planned construction of a new Coast Guard pier would not impact the site. (Hall, 1999, p. 3). In 1999 Wes Hall again returned to the island this time to conduct a geophysical survey using a marine magnetometer1 and positioning system with the objective of locating possible ship remains. From this survey 45 anomalies of interest were identified. Also during this period, a group from the Mary Rose Trust in the UK was requested to survey vessel “A”. The Mary Rose trust team reportedly dug multiple test trenches, excavated the site and brought over 150 artifacts from site A to the surface. (McKewan, 2006, p. 12). Unfortunately, the location or condition of these artifacts is not known. The cultural material & artifacts located in Scarborough Harbour are thought to be one of the world’s primary sources of knowledge about the seafaring, ships and the maritime culture of the 17th century. As such, a concerted effort was initiated in 2007 to obtain permission from the THA to conduct a proper scientific excavation and conservation of these endangered material remains. The objective of this survey was to locate and record 17th century shipwrecks associated with the Franco-Dutch naval battle of 1677. Three search areas covering approximately 5.7 million square feet (131 acres) were surveyed with side-scan sonar and magnetometer. Sixteen anomalies were identified. Thirteen of these targets were investigated by dive teams, and divers were able to identify material creating magnetic anomalies at eight of the sites. Three sites contained modern material. One site contained metal concretions possibly related to a 19th-20th century steam ship. One site contained a 17th-18th century anchor. Another site consisted of a sewer pipe and coherent ballast pile (which was not excavated). The remaining targets proved to be components of a 45 meter long wreck site consisting of a total of eight cannon of various sizes and calibers, galley bricks, ballast stones. The cannon and associated artifacts indicate that it is a coherent and potentially historically significant 17th century wreck site. Beyond these archaeological finds, the team also tested and successfully utilized non-invasive Structure from Motion (SFM) technology for site recording, exploration, planning, communication, logistics and educational outreach. 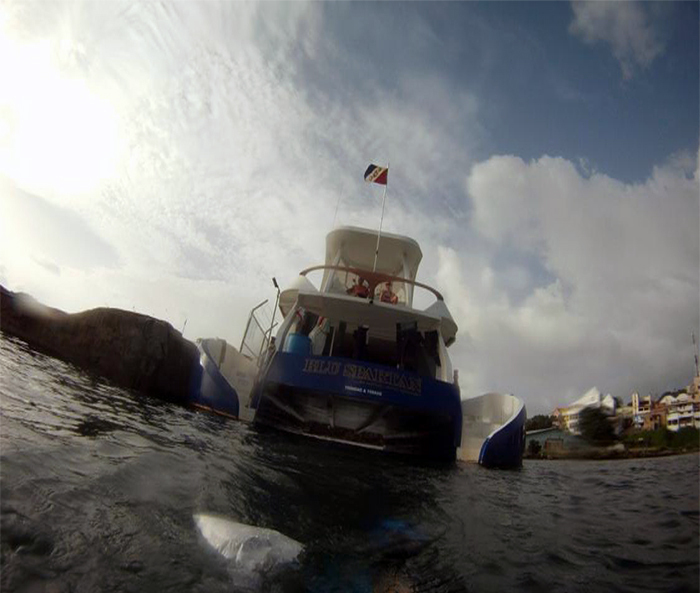 At the end of the 2013 season our team had relocated and surveyed all known wreck sites in the eastern section of the harbour where 17th cultural material was believed to be located. 1. Locate and investigate magnetic anomalies in Rockley Bay that may be associated with 17th century shipwrecks. This would be accomplished via the collection, analysis, and interpretation of side-scan sonar and magnetometer4 data. 2. Deploy dive teams to identify, assess, and investigate as many of the identified magnetic anomalies as possible. 3. Test whether innovations in non-invasive modeling technologies can be used underwater to accurately record large artifacts and sites in 3D space. The following content is used with permission of the authors; originally submitted as THE EXPLORERS CLUB FLAG 117 REPORT: “Archaeological Exploration of Rockley Bay, Tobago, West Indies” by Jason Paterniti, FRGS and Douglas Inglis May to 10 July, 2013. Read full report. During the seven week expedition, the team conducted test excavations at three potential shipwreck sites, pioneered new 3D recording techniques and collected samples of intact hull structure for dendrochronological dating. Long term capacity building activities included establishing the first dendrochronology laboratory in the Caribbean, breaking ground for Trinidad & Tobago’s first archaeological conservation laboratory, and cooperating with the Tobago House of Assembly (THA), the Tobago Ministry of Tourism and local stakeholders to promote professional underwater archaeology in Trinidad & Tobago. The 2013 RBRP Team (from left to right): Doug Inglis, Matthew Milne, Bob Steinhoff, Mike Gilbart, Dr. Kroum Batchvarov, Capt. Iain “Wabba” Milne, Dr. Nigel Nayling, Cassie Devney, Joe Bingaman and Tom Lacey. 3. Train university students to professionally survey, excavate and document submerged archaeological sites. 4. Evaluate local infrastructure, personnel and resources to determine if it is viable to conduct full scale archaeological excavation in Tobago. 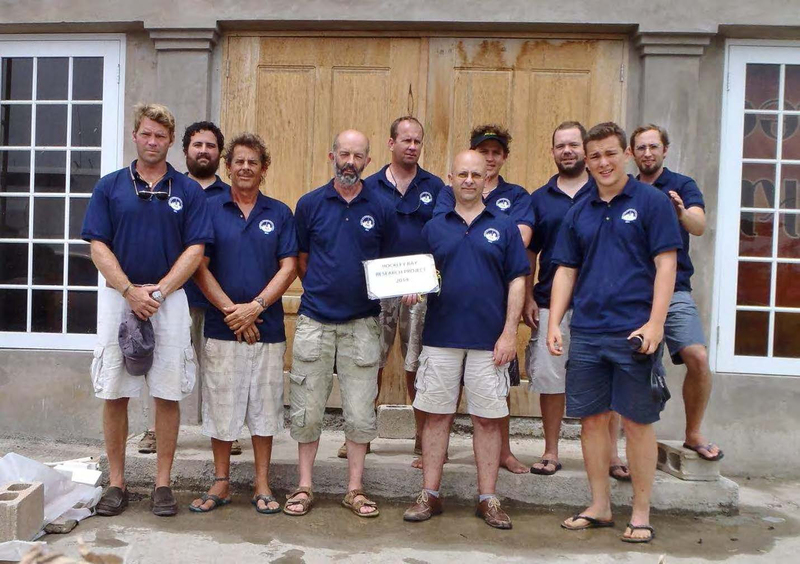 The Rockley Bay Research Project met its 2013 expedition season objectives, and made significant progress toward the overall project objectives. Our team has cooperated with the Tobago House of Assembly to conduct a professional archaeological expedition in Scarborough Harbour and to lay the groundwork for a new conservation facility. The RBRP team investigated four sites identified in 2012 and March 2013 to determine if they contained 17th century components. We recorded associated archaeological material and evaluated the threats to site integrity. Our team focused on excavating TRB-1, recorded its hull structure and collected dendrochronological samples. During this process, we trained university students in underwater archaeological field methods and collaborated with local stakeholders. Preliminary results indicate that TRB-1 may not be a 17th century wreck. Although numerous dendrochronological samples were collected, they did not match known chronologies. Initial evaluation of the hull structure suggest that the ship was not constructed in the Dutch fashion, and very likely postdates the 17th century. The results of our investigation will be professionally published and shed light on previous cursory reports. TRB-2 is a complex multi-component site. No additional evidence for a 17th century shipwreck was encountered during investigation. The cannon, which probably dates to the 17th century, was deposited on site during a modern salvage attempt. If there is a 17th century component to TRB-2, it is likely buried deep beneath 18th and 19th century material. Excavation at TRB-3 allowed our team to document the cannon, which is similar to the TRB-2 cannon and also likely dates to the 17th century. No evidence of hull structure was encountered at either TRB-2 or TRB-3. 14 June, 2012 – 24 June, 2012.) Read full report. 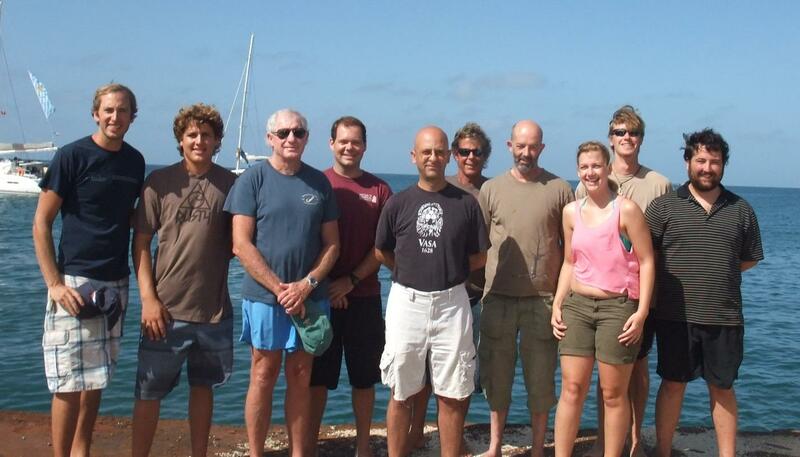 During the ten day expedition, the team located and recorded multiple cannon, anchor, ceramic, and metal artifacts as well as wooden hull remains of five to seven shipwrecks in Rockly Bay, Scarborough Harbour, Tobago. The team also investigated an 18th- 19th century wreck off of Monos Islands, Trinidad. 1. To locate and survey the major extent of 17TH century shipwrecks associated with the Franco Dutch naval battle of 1677 which took place in Rockly Bay, Scarborough Harbour, Tobago. 3. To investigate reports of undocumented 17th century shipwrecks in the islands around Trinidad for future possible study. The Rockly Bay Research project established as its primary objective locating 17TH century shipwrecks for survey and recording. The project team was successful in identifying multiple sites in Scarborough Harbour Tobago which appear to contain 17th century material and artifacts. Based on the material identified during the 2012 field season, site TRB-1 appears to be the most promising site to initiate a full excavation and recording because: While other possible sites were identified, the location of a wreck at Site TRB-1 been confirmed, The TRB-1 site lies out site of the path of commercial traffic in the harbour which will facilitate a safe and accessible working environment, TRB-1 remains buried which should increase the probability that the hull structure and associated artifacts may remain in a better state of preservation Any artifacts recovered from TRB-1 will be more unlikely to be intermingled with other material than sites which have been exposed. Currently the project team is in negotiations with the Tobago House of Assembly (THA) to obtain use of space to house conservation facilities to enable proper conservation of endangered hull remains and associated cultural artifacts located in Rockly Bay.